Nebraska was held to 132 yards of offense in a nightmare of a game, only obtaining 12 first downs the entire game. The Huskers are now 0-3 for the first time since the 1945 season. Not much went right for the Huskers in the game, though for a few brief moments, things looked promising for Nebraska. Adrian Martinez threw a strike to Stanley Morgan for a 32 yard gain over the middle in their opening drive. However the very next play, Martinez’s pass was tipped at the line of scrimmage, and picked off by Michigan’s Josh Metellus. Michigan took over on their own 36 yard line, stringing together a 6 play drive that was capped off on a one yard touchdown that was powered into the end zone by Wolverine fullback Ben Mason. By halftime, Nebraska trailed 39-0. In the second half, things didn’t get much better. 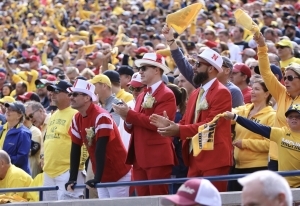 Nebraska finished with 39 total rushing yards, compared to Michigan’s 285. Martinez was pulled at halftime, only briefly reentering the game after Andrew Bunch went down with an injury. It was not serious, as Bunch returned to the game the next drive. “I hope Adrian doesn’t experience another day as rough as this one again,” Frost said. Martinez was 7 of 15 for just 22 yards and one interception. Martinez can hardly shoulder the blame for those numbers alone, as he was facing heavy pressure from the Wolverine defense, and the run game was never established. Penalties and poor special teams play continue to plague the Huskers. In the third quarter after already having played poorly, Donovan Peoples-Jones sliced through the porous Husker special teams units for a 60 yard touchdown. 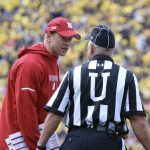 There were very few positives to take away as a Husker fan, but that doesn’t mean there weren’t any. Andrew Bunch and Wyatt Mazour put together a solid drive in the fourth quarter for a touchdown. Bunch finished 6 for 9 with just over 70 yards passing. 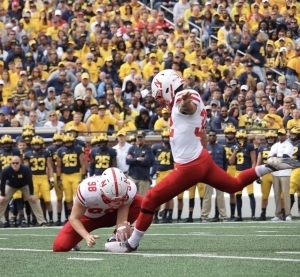 Place kicker Barret Pickering comfortably hit a 35 yard field goal to get rid of the Husker’s goose egg. With all of that said, the sooner the Huskers forget about this game, the better. 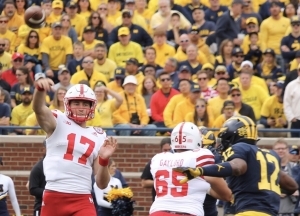 Nebraska’s next test will be to take on Purdue in Memorial Stadium next Saturday. Kickoff is set for 2:30, with pregame beginning at 9:30. 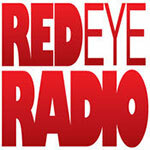 Tune in on 1400, KLIN for full coverage of the game.